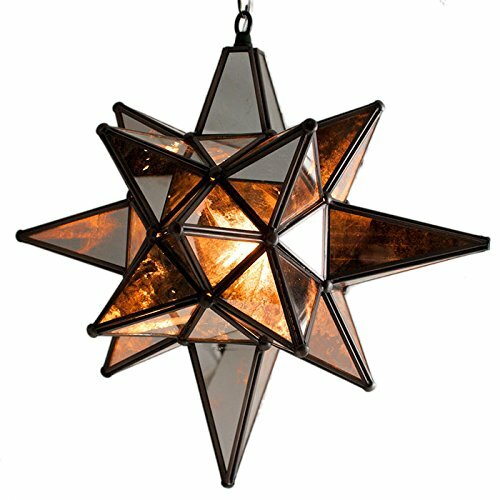 Star of Bethlehem Antique Mirrored Glass Star Pendant Light, Bronze Frame, 12x15 in. This Moravian star light features 18 points and bottom, top and two side points are elongated to make it look like the Star of Bethlehem. 3 ft chain, wire, and a ceiling kit for hard wire installation as a pendant light is included. Please contact us for any custom wiring requests. If you have any questions about this product by DuDa Home Decor, contact us by completing and submitting the form below. If you are looking for a specif part number, please include it with your message.